In this case the "extra passenger" is—in the unlikely event you don't recognize him—a cardboard cutout of The Most Interesting Man in the World, the spokesman for Dos Equis Beer. The driver was busted in the HOV lane of I-5 near Tacoma, and while the trooper did give him a ticket he did not confiscate the Man, according to the report. Just because I looked it up, the Man is portrayed by Jonathan Goldsmith, a 76-year-old actor who has appeared in movies and on TV hundreds of times (not even counting Dos Equis commercials). His career goes back to the mid-1960s, when he appeared on Perry Mason and My Three Sons, and even—this being my favorite—portrayed "Unnamed Redshirt" in a Star Trek episode ("The Corbomite Maneuver" (1966))! He appeared in something like 45 different series over the years, including basically everything in the late 1970s to early 1980s. His movie work included many Westerns, including The Shootist (1976), about which Wikipedia has this to say: "Goldsmith played a villain who was shot between the eyes by hero John Wayne, who fired blood capsules from a special pellet gun at pointblank range into Goldsmith's face for seven painful takes." Clearly, he was already interesting before he became The Most Interesting Man in the World. 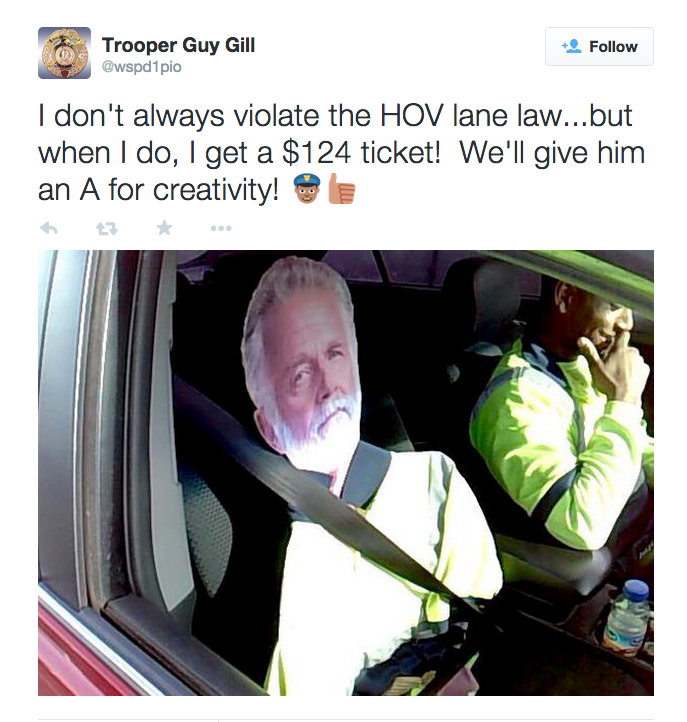 But unless you have the real Jonathan Goldsmith in the passenger seat, stay out of the HOV lane, my friends.